The Georgia Society of the American College of Surgeons (GSACS) is the primary voice for surgeons in the state of Georgia and its members realize that democracy is not a spectator sport. In our nation, public health professionals play a significant role in decision-making processes and policy formation. As members of the public health community, GSACS members’ involvement in the policy-formation process is essential. Click here to access the official website for the Georgia General Assembly. Use this web site as a tool to track bills, find and communicate with your state House and Senate members, and to follow legislative activity, meetings and issues before the General Assembly. Below are some simple things that GSACS members can do to have a positive effect on Georgia’s public policy formation. The Georgia Chapter vigorously advocates on important public health issues year round. Your participation will help because legislators listen to what their constituents have to say — constituents, after all, are a legislator’s first priority. The following resources will provide you with all of the information and materials you need to contact your policymakers and be successful in your advocacy efforts. 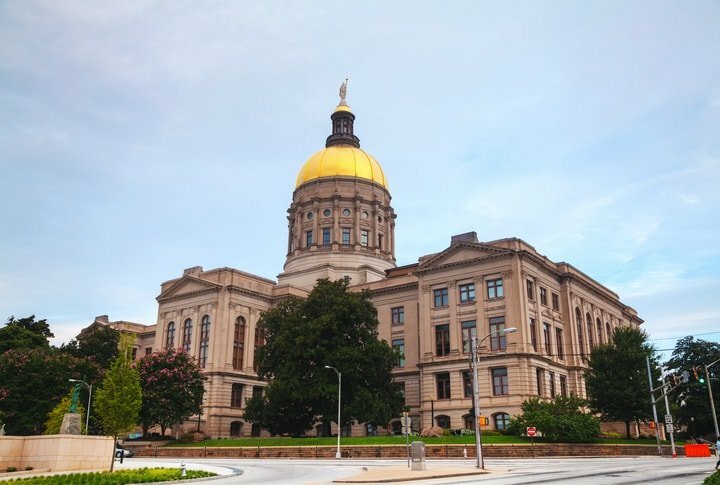 SURGPAC is nonpartisan, supporting candidates for the Georgia General Assembly who share GSACS’s commitment to patient safety and access to quality surgical care. 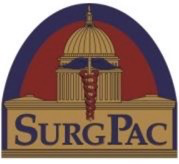 SURGPAC is a political action committee (PAC) formed to raise and spend money to elect candidates that are friendly to the practice of Surgery and the patients served by Georgia Surgeons. Who can contribute to SURGPAC? Any person, business or corporation can contribute to SURGPAC. So encourage the vendors that come into your office to contribute to SURGPAC. Are there limits on contributions to SURGPAC? There is no limit on the amount of money that you can give to SURGPAC, nor is there a limit on the number of contributions. There are limits on the amount of contributions that SURGPAC and individuals can give directly to candidates. How will SURGPAC help the practice of Surgery in Georgia? SURGPAC is a political action committee that seeks to change the face of Georgia politics by electing more pro-surgeon candidates to the state legislature, helping to retain current legislators that support Georgia Surgeons and the patients they serve and defeating those legislators that pose a threat to the practice of Surgery. In short, if we can not change their minds, we will change their faces. Would you like to make a contribution to SURGPAC, our state political action committee? SURGPAC promotes the election of state officials that support patients served by Georgia Surgeons. After you submit online payment, you will receive an e-mail receipt from KnowledgeConnex, GSACS’s online registration provider. You will receive an e-mail receipt from KnowledgeConnex after your order is submitted and your online registration will be complete. Why Should You Give to SurgeonsPAC? The political climate in Washington may change but one thing remains constant: our patients will always need surgery and surgeons. 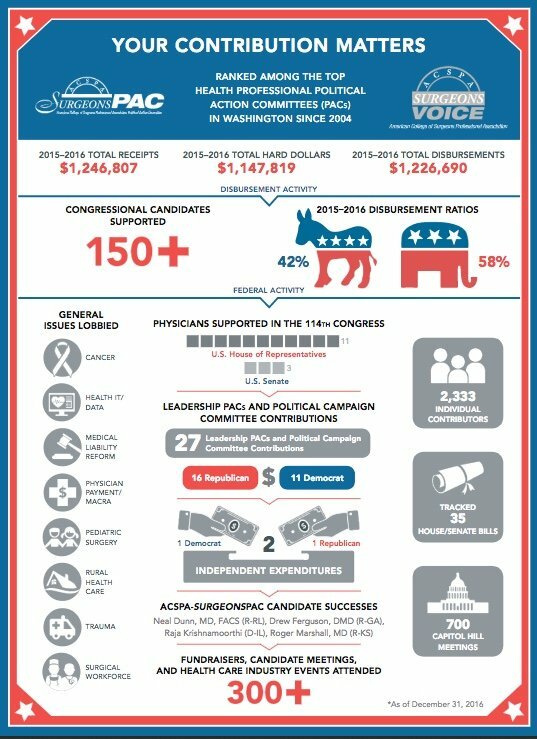 The ACSPA-SurgeonsPAC is nonpartisan, supporting both Democrat and Republican U.S. House and Senate candidates for Congress who share the College’s commitment to quality, affordable, accessible patient care. SurgeonsPAC needs a strong voice on Capitol Hill to ensure our profession and patients remain a top priority. SurgeonsPAC brings a national focus to local issues, so it is important to stay involved at both the local and the national levels.With our upcoming advocacy day in Washington, and several other ongoing physician payment, GME, HIT/data, cancer, trauma, liability reform and workforce initiatives the College is actively working to promote, we have a unique opportunity to expand our presence this election cycle via further engagement in the College’s advocacy and political efforts. While less than 3% of College members contribute to SurgeonsPAC, the potential to grow our market share and remain competitive among other medical PACs is great. Contributions to SurgeonsPAC are completely voluntary and any/all dollar amounts are appreciated and welcomed. I invite you to join, or renew, your SurgeonsPAC contribution today as a win for our PAC is a win for your patient. Contributions to ACSPA-SurgeonsPAC are not deductible as charitable contributions for federal income tax purposes. Contributions are voluntary, and all members of ACSPA have the right to refuse to contribute without reprisal. Federal law prohibits ACSPA-SurgeonsPAC from accepting contributions from foreign nations. By law, if your contributions are made using a personal check or credit card, ACSPA-SurgeonsPAC may only use your contribution to support candidates in federal elections. All corporate contributions to ACSPA-SurgeonsPAC will be used for educational and administrative fees of ACSPA and other activities permissible under federal law. Federal law requires ACSPA-SurgeonsPAC to use its best efforts to collect and report the name, mailing address, occupation, and the name of the employer of individuals whose contributions exceed $200 in a calendar year. ACSPA-SurgeonsPAC is a program of the ACSPA, which is exempt from federal income tax under section 501c (6) of the Internal Revenue Code.